We started new projects and continued working on old ones. We strengthened existing partnerships and planned toward exciting collaborations. We welcomed students and volunteers from the United States and grew our team in Costa Rica. As these major highlights of the past year may tell you, we've been busy! And in 2015 we accomplished all of this through the efforts of unfunded volunteers. If you like what we're doing and want to see us continue, please consider donating. Any amount is deeply appreciated. Our ongoing community documentation work finally crystallized into form with the creation of the South Caribe Roots Archive, a public history project documenting the people, places and events in southern Caribbean, Costa Rica, through family photographs and stories. We continued collecting photographs and interviews from local residents, hosted and planned exciting 2016 projects aimed at stimulating local participation in the development of the archive. Last March we hosted our first group of student volunteers from the Kelley School of Business at Indiana University, who joined us in Manzanillo for a week of service and learning through the Alternative Break Program. The students focused on themes of responsible tourism and local business, and completed a local service project in collaboration with the Mujeres Emprendedoras de Manzanillo, improving the physical space in which the women work in the community and the online space through which they share their vision and creativity with visitors from near and far. The trip was a huge success, and we are already busy planning for the 2016 trip. We were proud to participate in Santa Clara Law School's summer abroad program, "Human Rights in the Americas: Practicing Law in the Real World," as an internship host for Brittany Delbridge, who helped us gather important information from community members and wrote internal research memos on developing areas of our work. Just a few months before Brittany joined us in Punta Uva, we were in Boston for the final presentation of a year-long social justice project completed by law students at Northeastern University School of Law through the Social Justice Program, our second year to partner with the program and work closely with first-year law students. Students from Indiana University volunteered their spring break to learning and serving with the community of Manzanillo. RCP Volunteer Brittany Delbridge interviews Alda Cook Campbell about her family's use of medicinal plants. Matixando and the Rich Coast Project partnered to produce original music promoting the mission and ideals of our mutual community work, and to provide live entertainment at various public outreach events such as the Founders Family Dinner and Wolaba Parade. Matixando is a Costa Rican organization working throughout Latin America to fulfill its mission of awakening the passion for life in every person through art and music. Stay tuned for the upcoming release of the music video for "Mi Lindo Limón", and the audio recording of "Know your Roots, Know your Rights." Joining forces with Glenda Halgarson Brown, the director of the Casa de la Cultura of Puerto Viejo, and the Costa Rican Ministry of Culture, we helped bring into being the forthcoming digital album "100 Years of History: Reliving the Old Memories of Puerto Viejo, an Homage to Our Founders and Neighbors." Incorporating historic photographs, quotations and news clippings, this project highlights the contributions of 12 historic families and 12 memorable characters and will be released for public viewing in early 2016. Los Icebreakers perform at the Founders Family Dinner on July , 2015 at the Casa de la Cultura in Puerto Viejo. Photo by Katie Beck. Last summer we spent much of our time in the community sharing our projects and collecting information from prospective participants. 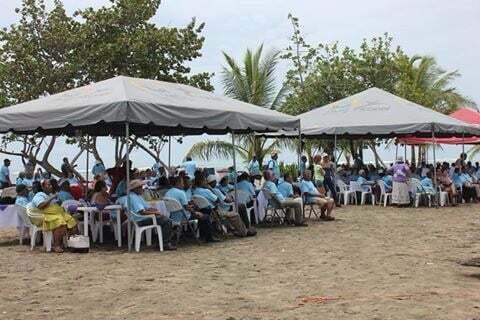 In June we went to Manzanillo to join the elders of Sixaola and Cahuita districts in a day hosted by the Municipality of Talamanca. In July we organized a special family dinner with the Casa de la Cultura and invited representatives of historic families of Puerto Viejo and Punta Uva to join us for a presentation of historic photographs and a shared dinner of traditional Caribbean dishes. In August we premiered the South Caribe Roots Archive through a live exposition of photographs during Wolaba Parade, an annual celebration of the area's Afro-descendent heritage. Throughout the Autumn we were dedicated to helping share information related to an upcoming municipal filing dealine affecting residents with properties in the Maritime Zone. After recognizing a widespread lack of awareness of the regulation, our team worked with a local attorney to develop English and Spanish language informational handouts that we distributed both physically and online. Día de Adultos Mayores in Manzanillo, June 18, 2015. Los Icebreakers perform with Los Rumberitos while photos from the South Caribe Roots Archive display on the screen behind. Hot Rocks, Puerto Viejo, August 2015.